The Royal Guard Doublet is not just for the sentries who guard the King and castle. 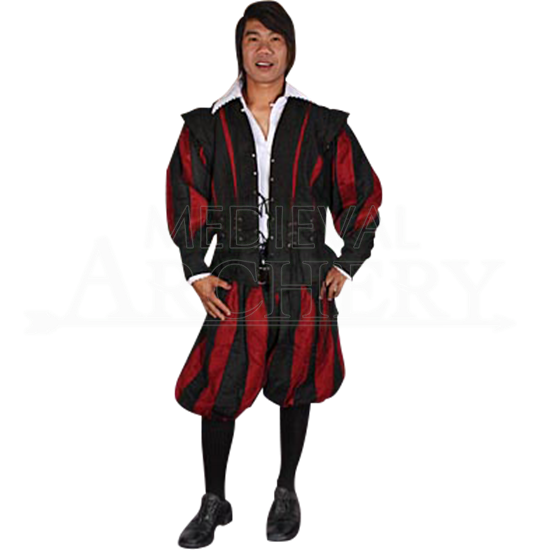 This doublet is perfect for any man who has need of a functional and attractive, fitted medieval jacket. This doublet is made from high quality sof suede fabric, making it soft to the touch and very comfortable to wear. The interior of the garment is also completely lined. The vest of this waist length jacket has a striped appearance, as a number of slashes are cut into the vest to reveal an underlying color. These cuts are decorated by laced eyelets around the waist of the doublet. The shoulders feature a cap sleeve, while the full-length sleeves are loose-fitted and end in a cuff at the wrist. The Royal Guard Doublet comes in a variety of color combinations, and is fastened via laces in the front. The sleeves are also removable, featuring buttons, which enables the wearer to quickly and easily remove the sleeves in times of need. The Royal Guard Doublet is a great combination of decorative and functional. The quality fabric and striped pattern make it rather appealing to the eye, while the style and design makes it useful and wearable year-round. What more could a man ask for in a medieval jacket? When ordering, the first Color dropdown menu is for the main color of the doublet. The Accent Color is for the slashed stripes. 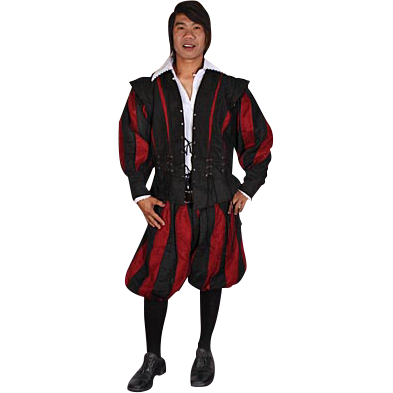 For example, the main image shows this doublet in Black with Red accents.